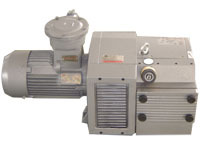 YBW series dry type vane pump pressure with the exhaust purity, low noise, reliable operation, etc. The pump works on the principle of the science of cooling and thickening ZuAng unique cooling unit, its send compressed air humidity is very ideal. Widely used in printing and packaging industry the flake material conveying and drying; Powder material in the field of food processing, such as transport and liquid mixing in the field of sewage treatment, etc.